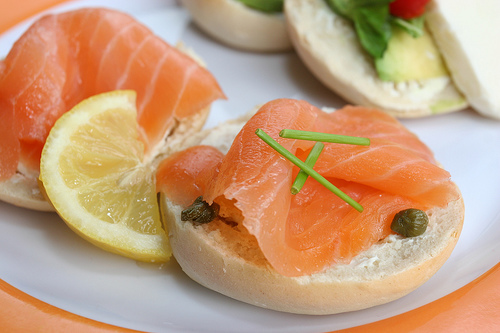 There are few dishes more elegant than fresh salmon; whether it is grilled, baked, broiled, poached or smoked, salmon seems to be internationally recognized as a "special occasion" sort of food. From salmon cakes to cedar planked, here are a few fantastic recipes to celebrate summer and the height of Copper River Salmon season! Simple, elegant and purely delicious! Quick and easy, using panko bread crumbs and capers, these salmon cakes will rock your world! An unbelievable savory-sweet flavor combination that will leave you hoping for leftovers. This creamy pasta dish features smoked salmon and sun dried tomatoes, two Northwest favorites! Summer flavors come together to create this perfect seasonal dish! I like the lemon and pepper salmon dish with some boiled french beans. I always check the below site for a new salmon dish. Hope you find interesting as well.